In the past we’ve got hold of a local SIM for Canada. HolidayPhone do a Canadian SIM card but they’re not cheap, and they wouldn’t be delivered in time for our trip. Canadian company Similicious have better prices, but on a short notice trip they also wouldn’t be able to get the SIM card to us in time, as international shipping would be about fourteen days. The other option was to get an international SIM, but looking through the options they’re all primarily focused on voice calls and texts, you can get an international SIM with data, but that adds to the cost even more. However looking at what we use day by day, the vast majority of the use we now make of our phone is data, not calls. Our phones are essentially handheld computers that just happen to make calls. Quite often we’re communicating through chat apps like Google Hangouts or Facebook Messenger. On the ground in Canada apps like Citymapper and Uber would be essential for getting around. If we wanted to make voice calls we had FaceTime and FaceTime Audio to talk to other iPhone users, and apps like Skype can also be used to call conventional phone numbers for fairly minimal costs. So it seemed like we could get by with a data only SIM – so would those be any cheaper. Having a search around I came across the Love2Surf card on next day delivery with Amazon. It comes pre-loaded with 100Mb of data, and has a website that allows you to add more, so we thought we’d give it a go. In the UK the card runs on the EE network, so we swapped out the normal 3 SIM before leaving for the airport, and were able to give it a test run whilst still in the UK. On arrival in Canada it hooked up to the Rogers network and it quite happily made a FaceTime call from the baggage claim hall. The main issue we had on the trip was a hiccup when we added data to the card part way through, which was a technical issue at the Love2Surf end, that left us with the card unable to connect to any network for a few hours, but it came back and we were able to carry on. There were a couple of occasions when we forgot we couldn’t make voice calls, but you’re not going to end up with a big bill from doing so as the card is only authorised to roam data. All in all it seemed like the little bit of convenience was worth it for the cost saving. Comparing the prices for Canada if you’ve got enough notice it won’t beat the cost of a local SIM from Similicious but if you’re visiting multiple countries touring around the Love2Surf card is certainly cheaper than buying a local SIM for each country. Do You Need a Digital Camera Any More? Apple and other mobile phone companies have been pushing how good the cameras in their phones have become for a while now, and certainly because most people have their phone with them a lot more often than they have a camera, people are taking many more pictures on mobile phones. However have the cameras on phones now got so good that you really don’t need a separate camera? Certainly they’re not as good as a digital SLR, but could they replace a digital compact camera? Until now, despite having had a mobile phone capable of taking pictures if I’ve been going on holiday I’ve always taken a separate camera. Over the years the pictures from the phones have been getting steadily better, but they were still noticeably better from the camera than the phone. However that has changed with my most recent upgrade to an iPhone 6 Plus where I have been regularly impressed by the quality of the pictures even in situations where previous phone cameras have struggled. So this year, as an experiment when we went on holiday I left my digital camera, currently a Panasonic Lumix DMC-TZ10, at home. You can take a look at the album of pictures we took on Flickr by clicking on the image below. The album contains pictures from two phones, my iPhone 6 Plus, and also pictures from the iPhone 6 used by my wife. Certainly they are a pretty good set of pictures, including some that my regular camera just wouldn’t be able to produce such as the panoramic shots. However there are some shots that the Panasonic would have made a better job of – anything that is zoomed for example as the Panasonic has an optical zoom whereas the phones are zooming digitally. A good example is this picture of a train arriving that used the digital zoom on the iPhone 6. There are also some practical issues, a big one being battery life. A digital camera can quite happily run on a single set of batteries for significantly longer than a multi-purpose device like a phone, indeed on the holiday there was one occasion where the iPhone 6 couldn’t be used because the battery was getting too low. Getting an emergency charge battery like this Anker unit can help if you get caught short on battery, but it would still be better not to have to worry. One big practical issue is that it is one less device to have to carry – more and more the smartphone is becoming a single multi-purpose device replacing still camera, video camera, sat-nav, handheld games console, and even the holiday paperback. 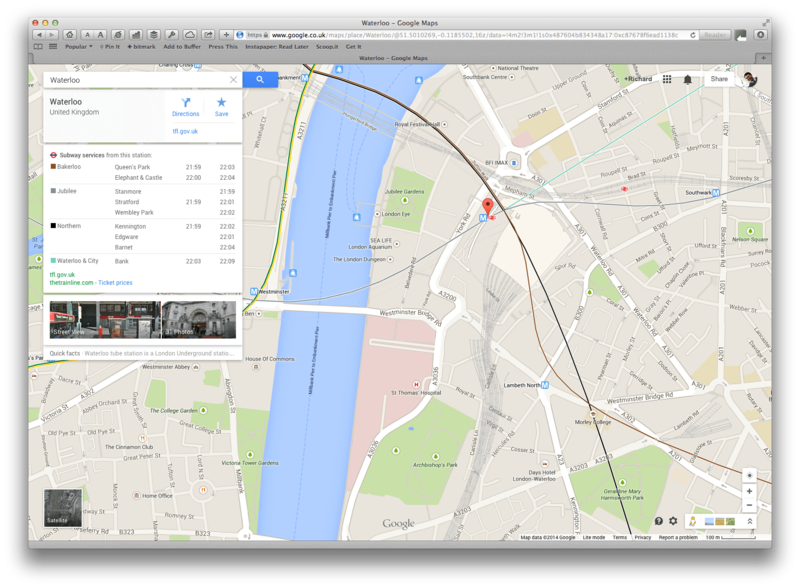 UK Wide Public Transport – What About Google Maps or Moovit? When I published my post about whether anyone could bring the level of flair Citymapper has shown in London to UK wide travel I not surprisingly got some comments back about services I had missed. To be fair I deliberately didn’t list off all the many public transit apps, as there are absolutely loads out there, however I thought I’d discuss two which came up, Google Maps and Moovit. They then say that they’ve added real-time information for Vancouver and Chicago, they don’t say anywhere that they have added real-time information for the UK. If you click through to the post by their GB product manager this explains that they’ve taken schedule information from National Express and Traveline so essentially what they’ve added is a much nicer interface to the existing UK wide travel planners. Basically somebody at the Daily Mail can’t actually read a press release properly, and certainly didn’t bother to check the actual site to see what is going on. Doing what the Daily Mail didn’t bother to do taking a look at Waterloo Station in Google Maps, for the Underground station they list the scheduled times of the trains, which might be a bit of surprise to most travellers on the tube, that there is actually a timetable! 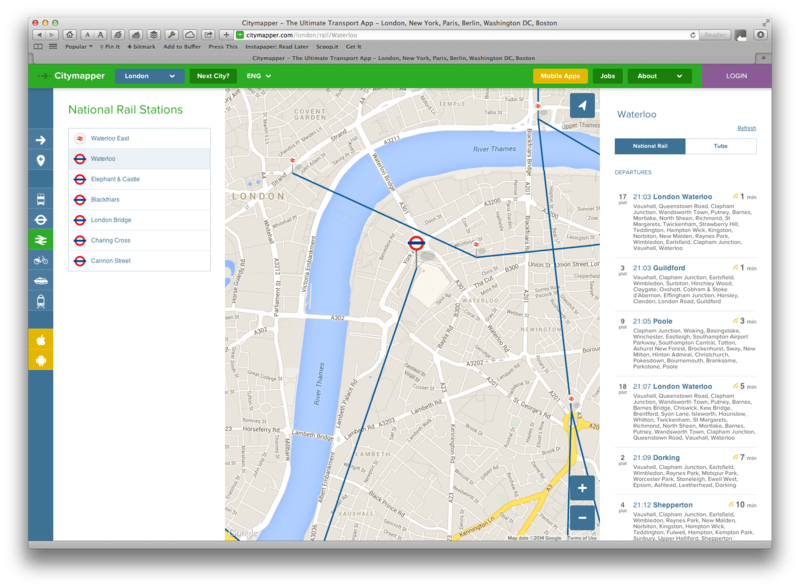 Swapping over to Citymapper we have the actual departures in real-time, as they have for stations all across London. Things are even more sparse when it comes to National Rail – although route planning from Waterloo will bring up accurate times, there are no departures on the Google site. 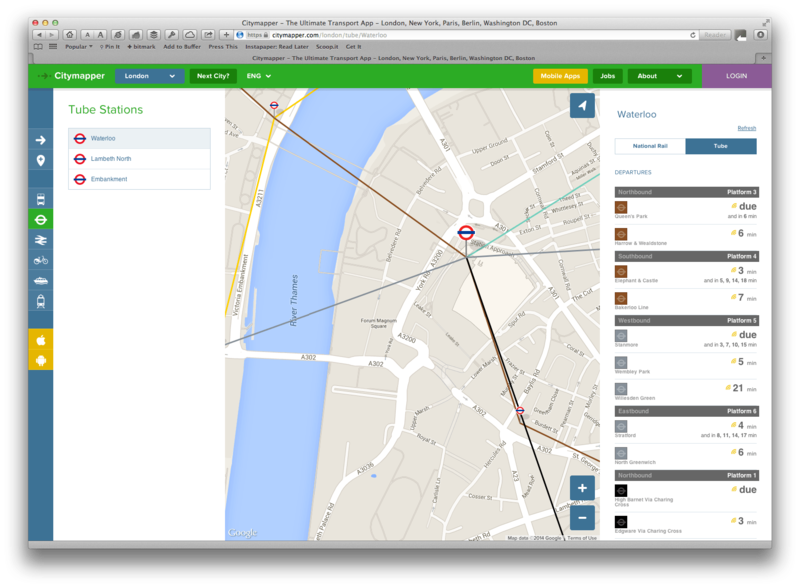 Taking a look at the same station in Citymapper you get a complete list of realtime departures. Citymapper being London focused has live departures for key commuter routes outside the capital, for example they have departures for Reading station. The situation is much the same when you look at the smartphone applications – no real-time data on Google, loads within London for Citymapper. Moving on to Moovit, once again the issue is real-time data. They are a bit better than Google, in that they do have some real-time data, specifically for some buses, but once again they don’t have the real-time data fields for National Rail. 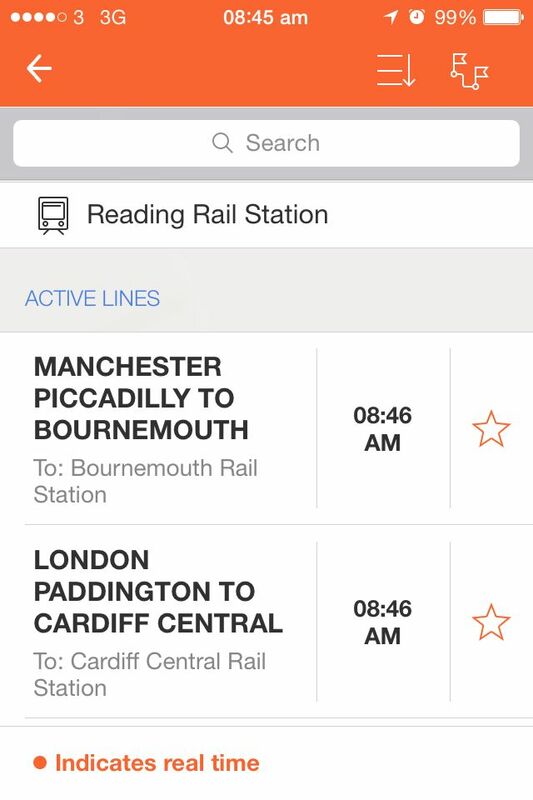 Looking at Reading this time, this is an example of what Moovit might show – note the message at the bottom mentioning that real-time departures will be highlighted in Orange. 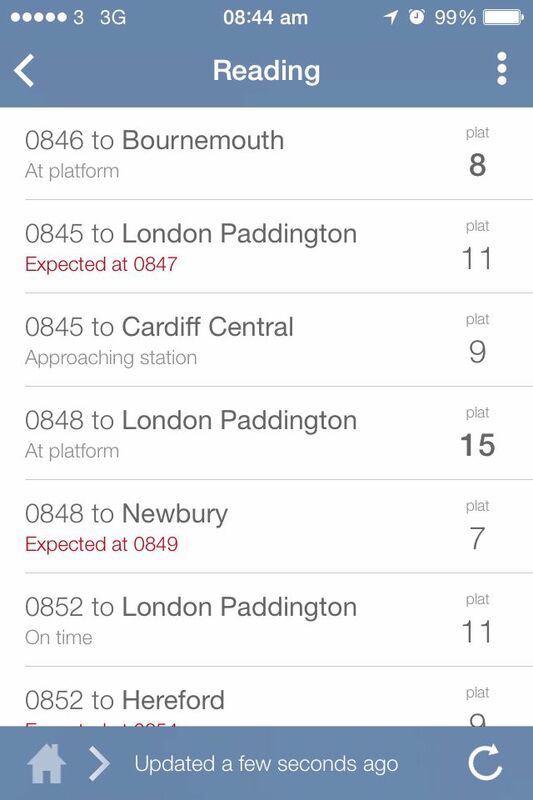 This iPhone screenshot is from the app of an excellent site called Realtime Trains that is a trainspotters paradise in terms of the , so that app is telling me platform numbers, whether a train is running late, and interestingly has a different departure time than Moovit is presenting. That also highlights another problem, the quality of the data in Moovit. One of the app store reviews comments that all the bus times on the reviewers local route were ten minutes out. It’s also remarkably difficult to find London Euston station on Moovit – it has Euston Square station and the Underground station, but the only way to actually get to see the scheduled departures from Euston using the app is to find the station on the map and click on it – it doesn’t come up in searches at all. Reading departures can equally be problematic when searching by hand as the app retains the historic split between the old Reading Southern Region station and the Reading Great Western station even though physically they’ve long since become one station. This means that there are two icons for Reading station almost on top of each other and two separate lists of departures. I have to say, I really want to like Moovit – as an avid user of Waze crowdsourcing public transport data seems a great idea. The developers seem to have come up with a way of tracking journeys that doesn’t decimate your battery level, but without accurate schedules and using all the available real-time data that is available for buses, trains and the Underground it is pretty useless, where Citymapper excels is that it tells me what is actually happening, not what should be happening. 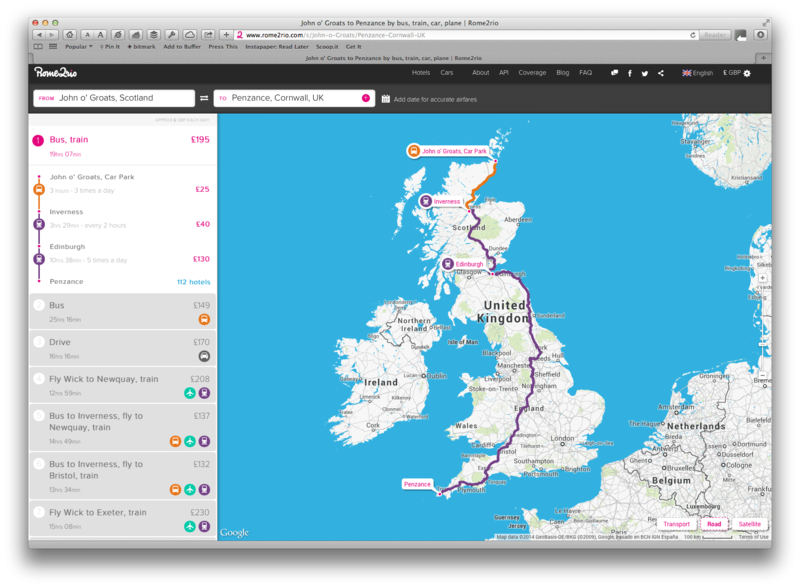 There is also a split between Scotland and England which none of the other route planning apps have which makes it impossible to plan a trip that goes over the border – whilst it may be argued that they are splitting by country, the actual underlying data they’re using for the schedules is UK wide resulting in the trains for Scotland apparently only being available on the English area, so it seems a slightly arbitrary split that renders Moovit even more problematic and unnecessarily so. So my initial conclusion remains, even taking into account Google Maps and Moovit, there is still no UK wide multi-modal public transport application with the flair of Citymapper – who is going to produce one? 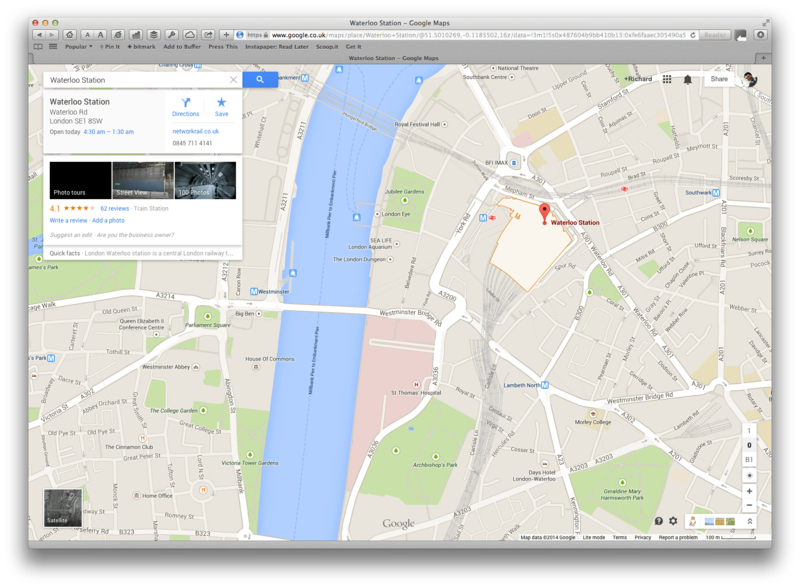 Will Google introduce real-time data? Will Moovit sort out their schedule data and add in more real-time? Or will Citymapper expand out to cover the whole of the UK? Can Anyone Bring Citymapper Flair to UK Wide Travel? I’m a real fan of Citymapper – for travelling around London it does a great job integrating all the trains, buses and the underground together in an easy to use app, a trick they’re repeating in other major cities across the world. However there is one big issue, whilst I go into London, I don’t live in London, I live out in Berkshire. The app includes train services out as far as Reading, but if I want to take a bus to the station I need a different app like one of the Bus Expert apps to get me to the station. The only buses in Citymapper are those run by Transport for London, so even connections for the outer reaches of the London Underground aren’t included for where I grew up around Rickmansworth. That’s not to say that there isn’t the real time data around, Citymapper make use of data feeds from Transport API, and their data covers a much wider area than just London, indeed you can find example sites and example applications that use their data on a wider level. There is also the government backed Traveline websites which have a set of regional travel planning applications, each working and looking different and having been developed by different suppliers appointed by the various regions, and then Transport Direct offer a national route planning service, along with a mobile web site, but no equivalent app. All of the government apps and sites work, but they aren’t exactly the kind of modern web and app experience you get from an app like Citymapper. 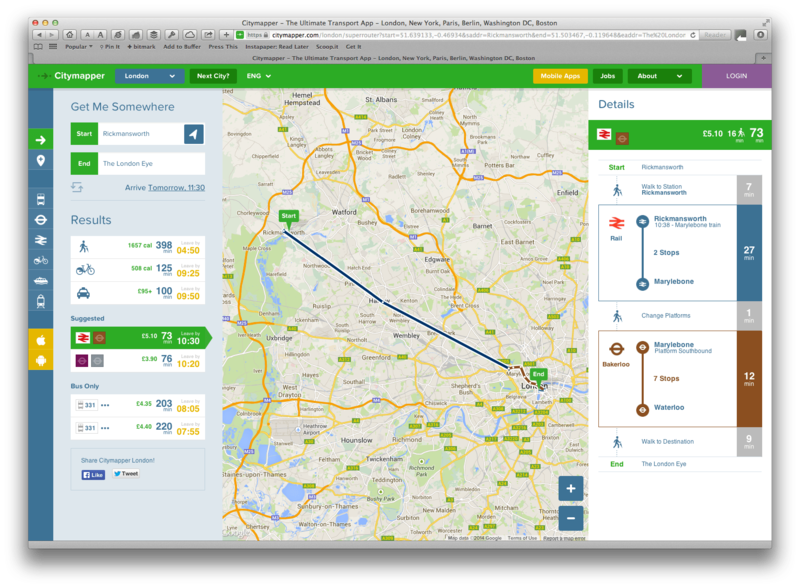 One of the better UK wide route planning apps is a cut down version of the Rome2Rio app called UK Transport Search, it’s got a small footprint and is pretty quick to produce reasonable routes, however it lacks any of the realtime information that Citymapper has. You can certainly plan trips and navigate around the country using a combination of apps, but nobody seems to have produced the kind of multi-modal public transport application that Citymapper have produced for London on a wider scale. We have all the bits, but nobody has actually pulled the whole thing together, so who is actually going to do it?